Vendors and their customers recognize that the future of x-ray resides chiefly in direct digital radiography (DDR). “As the technology continues developing, we’ll witness much advancement,” says Anne Ji, marketing supervisor of digital radiography for Canon USA Inc. In the United States, DDR market growth remains slow but steady, reports Helen Titus, worldwide digital capture marketing manager at Carestream, a DDR technology provider. “Expect to see annual growth rates hit double digits in three to four years,” she says. Like any evolutionary change, DDR is characterized by advantageous adaptations. In the x-ray environment, change translates into improved image quality and productivity. “Quick capture of high-resolution images, and the ability to preview them in seconds, is critical to patient care,” says Titus. Many healthcare facilities have already realized that DDR effectively addresses digital workflow issues, says Ji. “CR was a good in-between solution, but it never cut out the image processing step in x-ray exams, so it was not a true workflow improvement,” she says. With DDR systems, x-ray image display is available for immediate viewing anywhere on a PACS network, allowing imaging facilities to see more patients with the added benefit of better image quality. “In addition, the patient can have their x-ray images put on a compact disc to take to their referring physician or hospital,” says Viola Fernandes, radiography product manager at Siemens Healthcare. In addition to workflow benefits, DDR can reduce patient radiation dose. “Compared to conventional image-capturing methods, DDR potentially uses less radiation for image acquisition,” Fernandes says. David Hotchkiss, director of product marketing, modality solutions for Fujifilm, concurs: “Dose efficiency is a major industry trend that drives this market forward,” he says. But there is a second, and perhaps more significant, challenge: patient infection risk. “While a DR mobile unit has been considered an advancement, hospital-acquired patient infection has been traced to the tether on a DR mobile unit,” says Lobree. Vendors and customers are breaking free from the cord, and the impact is proving profound. “Wireless DR is transforming this area of imaging for the entire industry, especially in the United States,” he adds. “Through the years, x-ray has become increasingly flexible and, about 10 years ago, vendors came out with new detectors, but these remained in the realm of traditional configurations,” Lobree says. Healthcare facilities have gotten the message. “At the last RSNA,” he says, “Philips’ No. 1 customer lead generator was our wireless DR mobile product, the MobileDiagnost wDR.” A portable, DR wireless unit, MobileDiagnost wDR boasts the same image quality and workflow efficiency as a premium DR room. Its portability enables clinicians to easily image immobile patients, and it provides fast exposures for critical, pediatric, and bariatric patients, in a cost-effective fashion. As far as other innovations in DDR, Philips has also just launched the aforementioned DigitalDiagnost release 3.0, a customizable radiography system with a wireless portable detector that can be moved between the table and vertical stand and used for free exposures. The DigitalDiagnost 3.0 and MobileDiagnost wDR share the same wireless detector, Eleva user interface, and UNIQUE multiresolution image processing. The multiple, flexible room configurations provided by DigitalDiagnost 3.0 enable clinicians to customize their DDR department to balance clinical and budget needs. Titus adds that Carestream’s key competitive advantage is what it calls the “X-Factor.” “That’s the ability to move DRX detectors to any member of the DRX product family and to allow for flexible growth,” she says. A detector used in a mobile unit for a hospital’s early morning rounds can be moved to a general radiology room for the rest of the day. Also, DRX detectors can be moved from day use in radiology exam rooms to mobile units that serve the emergency department at night. Further, when a facility is ready to upgrade to a full DR suite, the DRX detector can be deployed in the new room. “The ability to move detectors allows our DRX family to deliver a higher return on investment for capital purchases,” she says about financial considerations. The DRX family also offers clients advanced software, including Carestream’s Tube and Line Visualization feature that provides instant verification for physicians placing tubes and PICC lines in seriously ill or injured patients. “This enhances care for ER and ICU patients,” adds Titus. At August’s AHRA annual meeting, Carestream introduced two new additions to its DRX family: The DRX-Transportable System/Universal Mobile retrofit kit (which converts any vendor’s existing analog mobile x-ray system to DR technology) and the DRX-Transportable System/Field Portable kit, which converts x-ray imaging systems used in diverse applications, such as nursing homes and field hospitals, to a DRX detector. Siemens helped pioneer the development of x-ray, so it’s appropriate that the company offers a portfolio of DDR products to meet clients’ clinical and budgetary requirements. The effort resulted in Multix M, which, as its name implies, is a multipurpose system that offers numerous application possibilities, according to the company. “It covers the radiography spectrum—from chest and skeletal to pediatric and orthopedic exposures—acquired either on the patient table, the wall stand, or as free exposures,” describes Fernandes. Images are available almost immediately, and exposures can be acquired using a single mobile flat detector. In turn, this offers customers positioning flexibility and utilization versatility. Canon is another DR pioneer—it introduced the world’s first portable DR detector, followed by the first full-size portable DR detector—and, true to its heritage, it has advanced into wireless DR technology, even as it continues providing a full line of DR detectors. Its newest line of DR detectors includes fixed, portable, and wireless products. All include the company’s proprietary imaging technology that provide higher resolution and lowered x-ray dose. Canon recently developed a glass substrate used in all its DR flat-panel detectors. This substrate features a 125-micron pixel pitch. 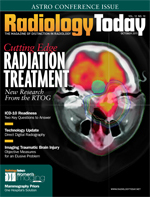 Products provide higher-resolution images while lowering x-ray dose to the patient. “Low-dose efficiency is the focus that drives our product development, and this will be seen in the current line of DR detectors as well as future products,” says Ji. As the x-ray equipment market expands and fragments, the importance of adaptable and game-changing equipment, post-sale product support, and quality technical training will rise, says Dave Widmann, general manager for GE Healthcare’s x-ray rad/R&F business. From Konica Minolta comes the Aero DR wireless flat-panel detector system. This 14- X 17-inch cassette-sized detector has the same dimensions as an ISO 4090-compliant film cassette and will fit into an existing wall stand or table bucky without any modifications. Applications include general radiography and portable radiography, says Darren Werner, the company’s DR product manager and technical marketing manager. Features include the CsI scintillator that delivers high detector quantum efficiency and workflow tools, including the hybrid image processing procedure code mapping. The product offers three-second image preview and 10- to 17-second panel refresh time. The single uniform S/W platform allows for DR and CR operation, and its wireless and wired modes of operation suit all imaging needs. In addition, cost of ownership is low. The long-life battery technology delivers five to seven years of use before it needs to be replaced, and its rugged Superframe structure ensures resistance to damage from impact or accidental drops, says Werner. “We’ve reached the stage where DDR is needed and recognized as a true solution,” says Ji. Vendors and their customers recognize that the future of x-ray resides in DDR. “As image quality and dose safety improves, as well as cost-effectiveness and increased access to x-ray equipment, usage of digital x-ray will expand in scope,” says Widmann.